Encourage school administrators not to cut vital programs for students with this academic complaint letter. My name is Susan White. My daughter, Lucy White, attends school at Anytown Middle School. 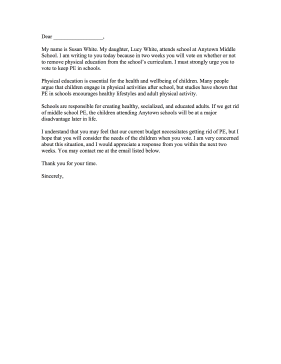 I am writing to you today because in two weeks you will vote on whether or not to remove physical education from the school's curriculum. I must strongly urge you to vote to keep PE in schools. Physical education is essential for the health and wellbeing of children. Many people argue that children engage in physical activities after school, but studies have shown that PE in schools encourages healthy lifestyles and adult physical activity. Schools are responsible for creating healthy, socialized, and educated adults. If we get rid of middle school PE, the children attending Anytown schools will be at a major disadvantage later in life. I understand that you may feel that our current budget necessitates getting rid of PE, but I hope that you will consider the needs of the children when you vote. I am very concerned about this situation, and I would appreciate a response from you within the next two weeks. You may contact me at the email listed below.